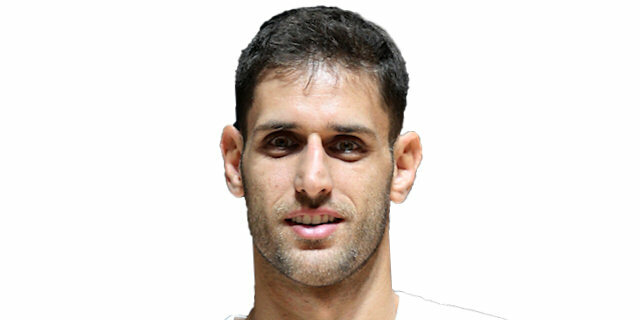 In a physical battle that went down to the wire, EA7 Emporio Armani Milan registered its first road win of the Top 16 by edging reigning Turkish Airlines Euroleague champion Olympiacos Piraeus 86-88 on Thursday. Milan improved to 6-3, stayed second in Group E and won its second game against Olympiacos, which dropped to 4-5. Keith Langford paced the winners with 20 points and 8 assists. Gani Lawal added 13 wile Curtis Jerrells had 11 for Milan. Stratos Perperoglou led Olympiacos with 22 points. 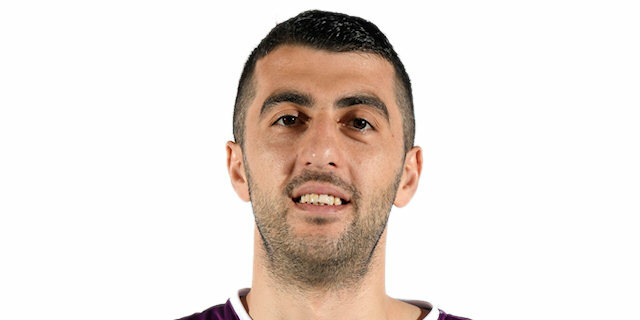 Georgios Printezis scored 16, Kostas Sloukas 13 and Bryant Dunston 11 for the hosts, who were without reigning Euroleague MVP Vassilis Spanoulis. Olympiacos opened the game with a 10-0 run and an outstanding Perperoglou allowed the Reds to get a 29-17 margin late in the first quarter. Milan found its regular go-to guy in Langford, who brought Milan within 29-23 after 10 minutes. 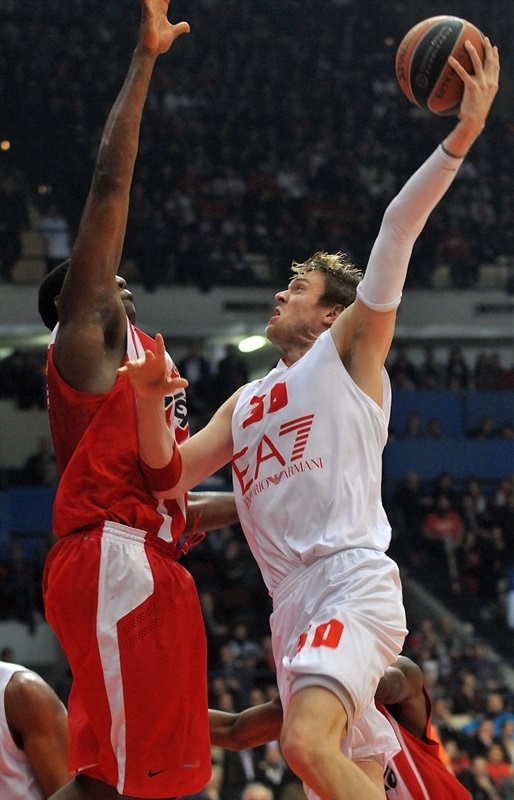 He got help from Jerrells and Kristjan Kangur to give Milan its first lead, 40-41. A three-pointer by Jerrells gave the guests as 47-50 edge at halftime. Both teams played with even more intensity after the break, but Jerrells and Langford managed to keep Milan ahead, 63-65, through three quarters. A 0-8 run that Lawal capped with free throws made it a double-digit game, 63-73. 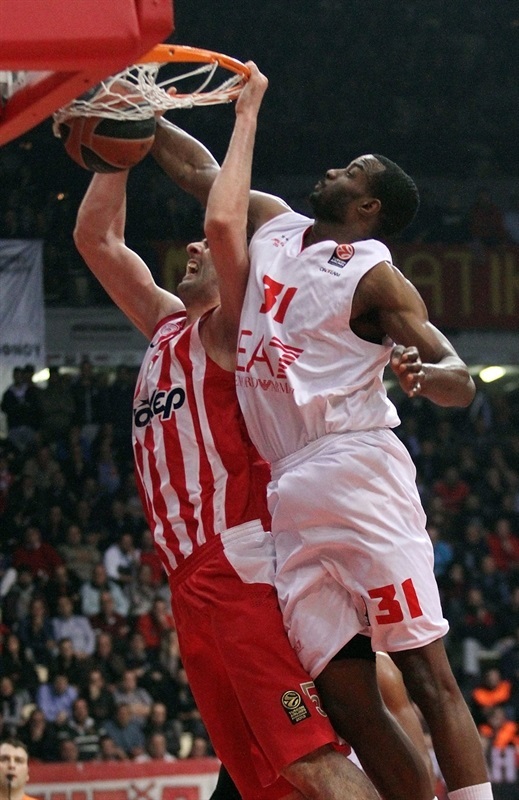 Olympiacos rallied and a jumper by Perperoglou gave the Reds an 81-80 lead. A jumper by Daniel Hackett and a critical three-pointer by Langford allowed Milan to cruise to a really important win. Dunston got Olympiacos going with a big block on Samardo Samuels and a jump hook. Vangelis Mantzaris shined with a driving layup and free throws by Dunston gave the Reds a 6-0 lead. Milan kept missing shots even around the basket before back-to-back jumpers by Kostas Sloukas and Perperoglou made it a double-digit game, 10-0. The guests missed 7 shots and picked up 2 turnovers before Samuels stepped up with a layup. Perperoglou answered from downtown and improved on Nicolo Melli's corner jumper with 3 free throws for a 16-5 Olympiacos margin. After Samuels made foul shots, Brent Petway buried a three-pointer. A backdoor layup by C.J. Wallace brought Milan within 19-9. Perperoglou and Langford exchanged triples and Wallace got the guests closer, 23-15. Olympiacos kept getting to the free throw line as Printezis, Perperoglou and Giorgi Shermadini hit a pair each. Langford fed Lawal for a slam, nailed a big triple and added a layup-plus-foul to keep Milan within 29-23 after 10 exciting minutes. Matt Lojeski nailed a turnaround jumper early in the quarter. 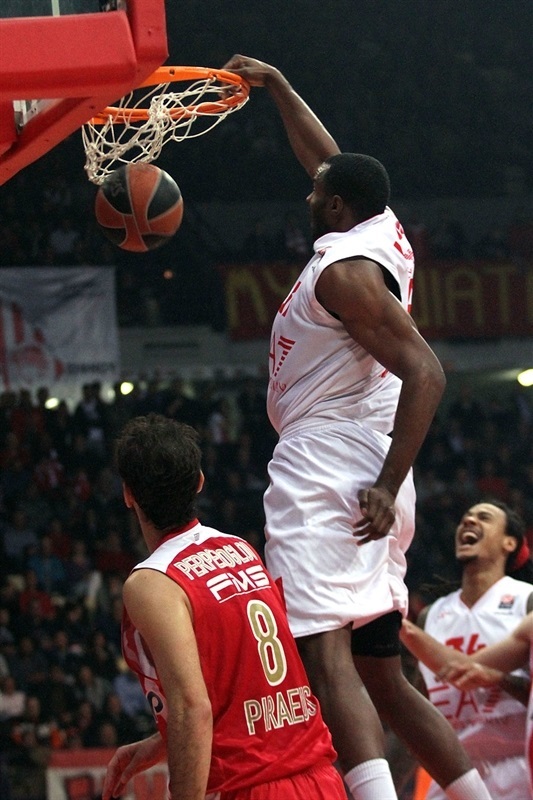 Lawal took over with a high-flying alley-oop jam, as Olympiacos started to miss open shots. Meanwhile, a three-point play by Bruno Cerella and a wide open triple by Curtis Jerrells capped a 2-14 run that tied it at 31-31, causing the Reds to call timeout. 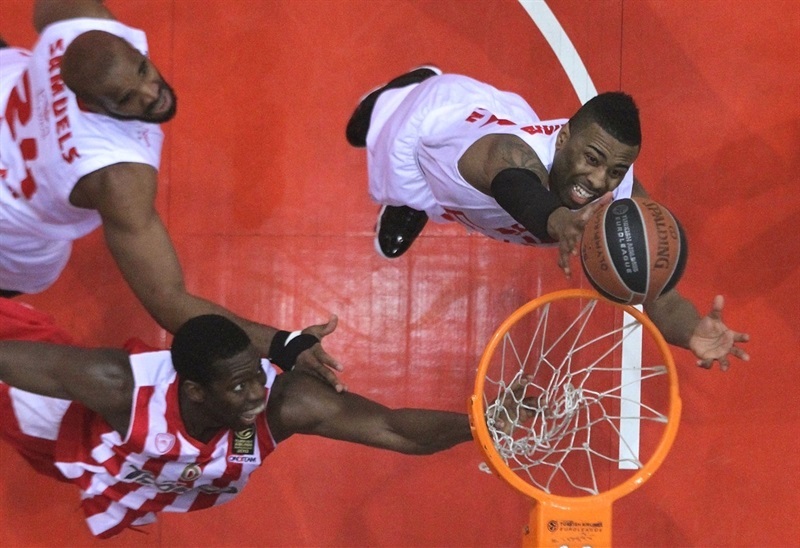 Shermandini rescued Olympiacos with a dunk, but Langford scored in penetration. 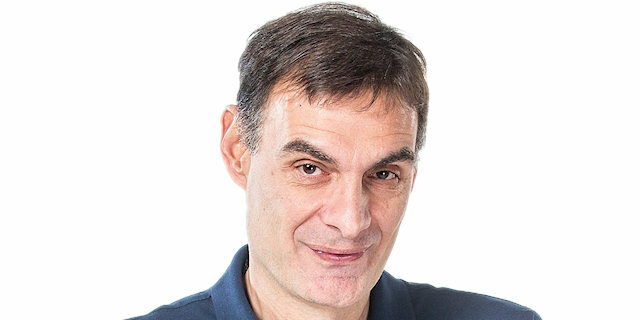 A put-back basket by Printezis gave the hosts a 35-33 edge. 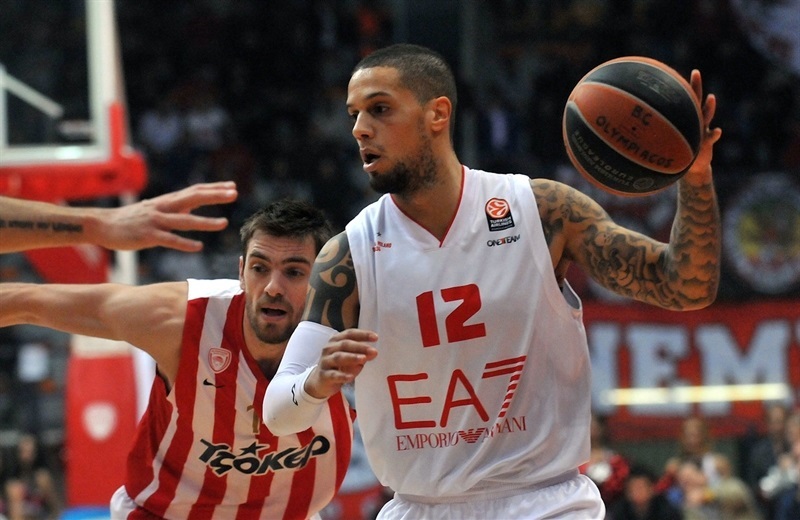 Jerrells shined with a driving slam, but Shermadini and Printezis restored a 38-35 Olympiacos lead. After David Moss downed a corner triple, Printezis hit free throws. A three-pointer by Kristjan Kangur gave Milan its first lead of the night, 40-41. Dunston stepped up with foul shots, but Daniel Hackett singlehandedly kept the guests ahead, 42-45. Printezis split from the foul line and Lojeski dunked off a steal to tie it at 45-45. Langford kept pushing Milan with a pair of free throws that Perperoglou matched with a jumper. Jerrells nailed a triple that fixed the halftime score at 47-50. Sloukas tied the game with a three-point play right after the break. 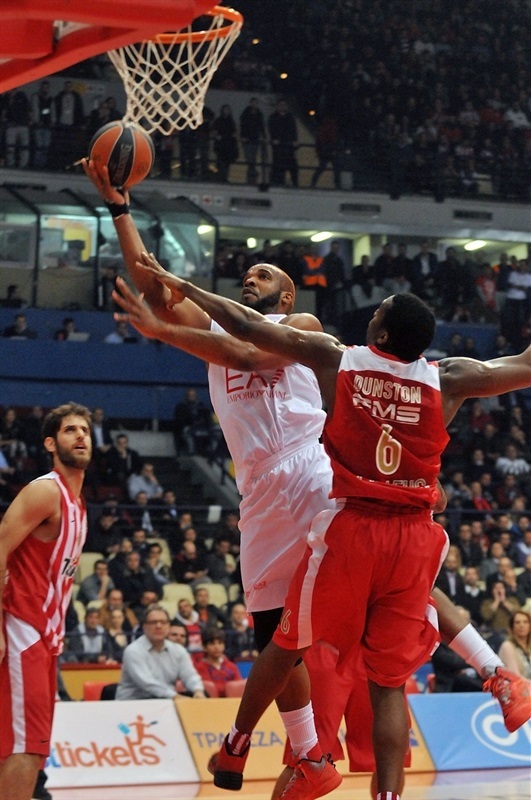 Dunston shined with an acrobatic basket for a 52-50 Olympiacos edge. Milan was held scoreless for more than two minutes until Hackett stepped up with a three-pointer. Samuels shined with a driving layup and traded free throws with Perperoglou to make it 53-56. Perperoglou kept pushing Olympiacos with a driving basket, as Olympiacos tried Sloukas as point guard. Both teams had entered the foul bonus already, as the physical, intense battle continued. 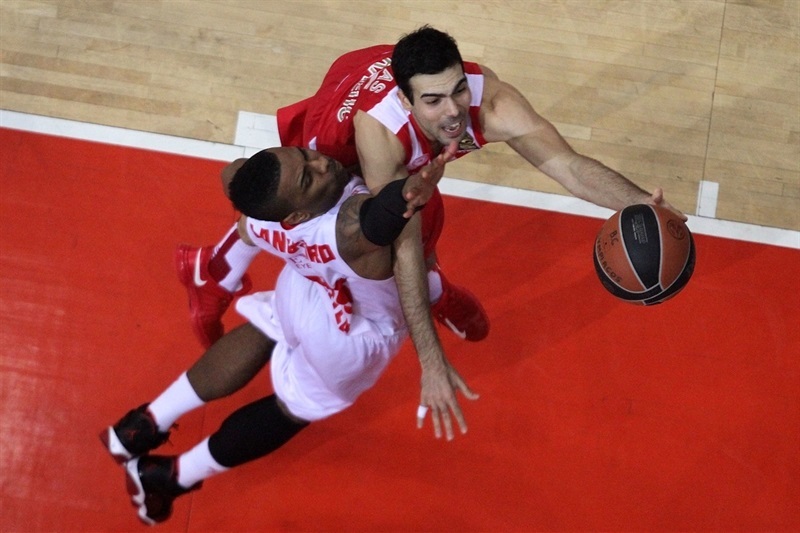 Printezis and Samuels traded free throws and a jumper by Sloukas restored a 59-58 Olympiacos edge. The hosts improved their defense late in the quarter and a dunk by Shermadini ignited the crowd at 61-58. Nicolo Melli took over with a slam off a Milan timeout, which Langford followed with a five-meter jumper for a 61-62 edge. Jerrells capped a 0-7 run with a triple. Shermadini made free throws to keep Olympiacos as close as 63-65. Langford provided a highlight with a driving basket and a put-back slam by Lawal made it a 6-point game. Kangur scored again and free throws by Lawal capped a 2-15 run that gave Milan its first double-digit lead, 63-73, with over 8 minutes left. Printezis struck from downtown and added a layup to get the crowd involved at 68-73. Sloukas and Lawal made free throws, but Perperoglou swished a five-meter jumper to close the gap to 71-75. 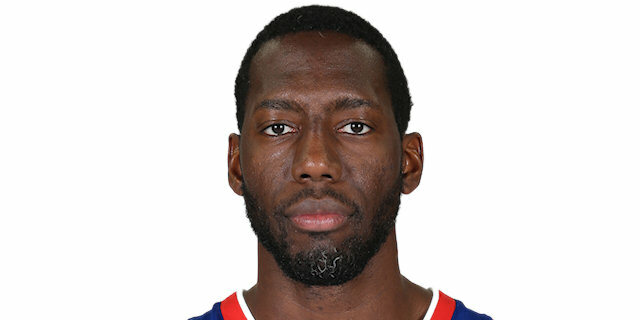 Lawal sank a long two-pointer and Dunston kept the Reds within 73-77 with four minutes to go. Mantzaris ignited the crowd with a three-pointer that forced Milan to stop the game at 76-77. Moss took over with a critical three-pointer, but Lojeski immediately answered from downtown and a jumper by Perperoglou completed yet another Olympiacos comeback, 81-80, with two minutes left. After Hackett nailed a mid-range jumper, Dunston missed free throws and a three-pointer by Langford sealed the outcome, 81-85, already in the final minute. A great defensive effort allowed Milano to force Olympiacos into a 24-second violation and free throws by Kangur caused Milan to start celebrating a long-awaited road win. "I think that we tried to do everything possible to win that game, but it didn’t happen. They made some big shots and unfortunately we lost the game, despite the great effort by the players and the amazing support we got from our fans. I think that we have no chance to get second place in the group and have the home-court advantage in the next round, but we have to come back and fight in every remaining game to advance to the playoffs. It is the third consecutive game we lose due to details and decisions in the last minutes. Momentum is against us, this is the truth. Dunston played a fantastic game, but missed 2 free throws, while Lawal hit a great but unusual for him shot. I was obliged to give more time to some of our players and had a limited rotation. At the end of the game we had 16 points more in index rating, but they won because of the three-point shots. We have to congratulate EA7 Armani Milan, because they play with lots of confidence." 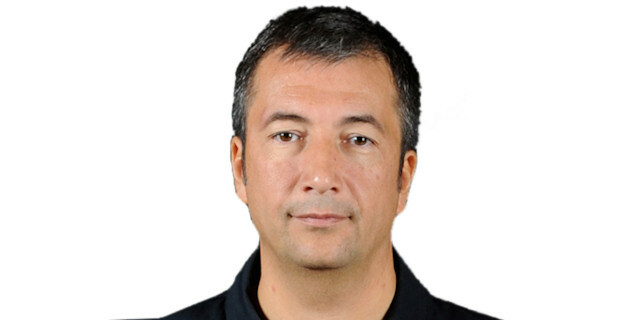 "I have to congratulate both teams for their performance and because neither Armani Milan, nor Olympiacos surrendered. Olympiacos had an excellent approach to the game’s needs and tried to overcome the absence of Spanoulis by taking the maximum from the rest of its players. I feel proud of my players because they came back and showed their character, which was necessary to escape with such a great victory from Piraeus. In the last minutes we allowed our opponents to cut the margin and have the chance to win, but finally we did it and this is great for our confidence and our ambitions in the Euroleague." "We didn’t play defense at all. We played a good offensive game, but if you don’t play defense in a home game, you have no chance to win. We gave them a lot of open shots and missed crucial boards, so they took advantage of these situations and got the victory." "I am happy to return and play again for Olympiacos, but I am sad due to our loss to EA7 Armani Milan. However we have five more game to play and I am optimistic that we can make it to the playoffs. We didn’t play good defense and since we allowed them to score 88 points in a road game, it was a risky situation. Now we have to work hard and try to fix our problems as soon as possible. " "We made a great effort, but EA7 Armani Milan has a lot of quality and talent and they took advantage of our mistakes to beat us. We got an early lead, but it was not possible to go like that until the end. We came back from 10 points behind, but they sank some great shots and they killed us. Now we are waiting for Vassilis Spanoulis to be back on the court and try our best in the remaining games in order to make it to the playoffs."